A huge part of overcoming the battle for the mind is being aware and focused on the reality we face each day. We have to stay vigilant without becoming paralyzed by the struggles that confront us. We have to stay alert without losing sight of the joys and the call of God on our life. Reminding ourselves of who God has equipped us to be, victors not victims, we become skilled warriors into whose hands the victory has already been given. The fight is not ours, we simply need to stand firm, equipped in God’s armor. He fights for us and has in fact already won the battle! Even knowing this, it’s easy to stray from God’s perfect plan, not far, but enough to remind it is a battle to stay focused and remain positive, content and satisfied in God alone. We need to remember to not let circumstances consume us, to keep focus on living fully and well today, without worry for tomorrow. I need to continually ask God to remind me to be intentional and compassionate in what I do, think and say and to not get upset with myself and others over small things, reminding myself of who I am in his sight, his precious and beloved child. Every day God is faithful to draw me back, to remind me that he is my refuge, my strong tower, my faithful and merciful and powerful God who loves me, pursues me, and desires his best for me. This ‘best’ is my heart’s desire and it is found only in him, through the cleansing and the guarding of my heart and the daily renewal of my mind. This entry was posted in Faith, Living With Purpose and Passion, Relationships and tagged 1 Corinthians 8a, Battle for the mind, God has already won the battle, God is faithful, guard your heart and mind, maintain a thankful heart, Trusting God in the battle, Victors in life's battles, Victors not victims on October 31, 2013 by . Have you ever been convinced that a certain circumstance was a problem, only to discover that it happened in perfect timing to achieve a greater purpose…maybe even to save your life? I recently bought a stair stepper – cross trainer at a garage sale. Perfect timing: the person selling it was one who went on one of our post-Katrina missions to New Orleans. This (not) ‘chance’ meeting revealed that she too has Leukemia and provided opportunity to share about God’s goodness in the midst of trials we all face. On the ‘heels’ of my recent hiking progress, I started using the cross trainer last week, being cautious to not extend the cardiac part of the workout as doctors advise my body is not yet ready for that. I completed only 50 ‘steps’ the first day, 75 the next, and 100 on day three. On Saturday, day four, my legs completely locked up in severe pain, severely limiting my walking. I nursed the muscles for two days before going to the medical clinic on Monday. 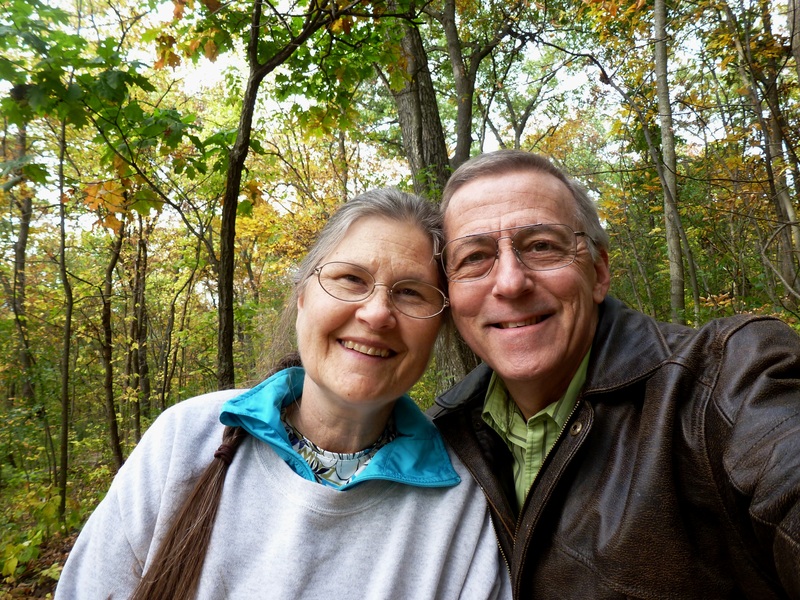 Back home already, Marcia and I reflect on how many times God uses one seemingly untimely and unwanted circumstance to achieve a greater good for us, for others, and for his kingdom. . . and how he accomplishes this in his perfect timing. I wonder, what pain or sorrow is God using today to achieve his greater purpose in your life and in others, according to his perfect timing? This entry was posted in Faith, Leukemia/Cancer, Relationships and tagged DVT, God works all things for good, God's timing, leukemia induced blood clot, Pain accomplishes good, Perfect timing, Romans 8:28 on October 30, 2013 by . What trials have you faced or are you now facing that pose a battle for the control of your mind? Is it a serious illness, the grief that accompanies a serious loss, a deep disappointment with how life has turned out, a continual longing for satisfaction that always escapes you, or a temptation you can’t seem to escape? Each of these and others affect the way we perceive and respond to our circumstances. Unattended and unresolved, they influence how we perceive ourselves and lead us to question our very identity and how we perceive and respond to others and to God. This is the spiritual battle for the mind. It is a battle we will each fight all our life. But although we enter the battlefield each day, it is not God’s intent that we are defeated by it. On the contrary, although we won’t fully escape the battle until he calls us home to heaven, he equips us to overcome the battle while we live now. He desires us to experience victory and abundant joy each day, even as we face our battles. But if we ignore or neglect the tools God gives us to fight the battle, we bring even more distress to our minds, and confusion that prevent us from experiencing victory over the struggles that confront us. In absence of relying on God, we trust in our own abilities or we wallow in self-pity, so consumed by the wounds we experience, we find no strength to seek the healing touch of the great physician. What are we to do in such a daily and life long struggle? First, we need to remind ourselves that “our struggle is not against flesh and blood…but against the spiritual forces of evil in the heavenly realms.” (Ephesians 6:12) Your fight is not with your spouse or child or coworker, it is against evil forces that war against healthy relationships. If we want to live a victorious life, we must be aware of this reality so we can be vigilant of the real dangers before us. We have to know the enemy before we can defeat them. Second, we have to equip ourselves with God’s tools for surviving the battle. How foolish it would be to walk into a real battlefield without protective armor. “Put on the full armor of God.” The armor includes truth, righteousness, peace, faith, the Word, and salvation. (Ephesians 6:11-18) “Take captive every thought and make it obedient to Christ.” (2 Corinthians 10:5) Let’s not idly walk into minefields unaware of their danger. The daily battle may rage on. Trust God and you will be able to stand firm, and victorious! This entry was posted in Faith, Living With Purpose and Passion, Relationships and tagged 2 Corinthians 10:5, Be transformed by the renewing of your mind, Ephesians 4:22-24, Ephesians 6:11-18, Ephesians 6:12, Mind governed by the Spirit, our struggle is not against flesh and blood but against evil, put off the old self, Put on the armor of God, romans 12:2, Romans 8:6, Take captive every thought, Victorious in life's battles, Winning the battle for the mind on October 29, 2013 by . The horse comes back and brings another horse with him. Good news, you might say. The farmer gives the second horse to his son, who rides it, then is thrown and badly breaks his leg. Disciplining your mind to habituate to a positive “good news” attitude will help you see problems as opportunities. This is an ongoing challenge that requires daily focus to maintain this perspective consistently. For sure, this life view will rescue you from the paralysis of inward focus to find the freedom of focusing on what God intends to reveal. There was a cartoon of a turtle on its back; with clear view of the sky, he concluded, “I’m flying!” Hilarious as the image was, his delusion about flying offered absolutely no help to overcome the fact that he was in fact STUCK on his back. Positive thinking helps us to FEEL better about our ‘bad news’ and to temporarily escape the pain of our circumstance, but eventually we have to come back to the reality of how to actually deal with the problem. The really ‘good news’ is that God knows us – and our ‘bad news’ situation – perfectly. Furthermore, he cares deeply about us. He offers his perfect perspective and counsel by providing his Spirit, grace, strength, and power to rise above our circumstance…to become victorious over them. Now THAT’s good news indeed! Here’s to seeing the “good news” God intends for you to see and share with others today! This entry was posted in Faith, Living With Purpose and Passion and tagged Beyond positive thinking, Chinese good news parable, Good news, Mark 16:15, Philippians 1:12, preach good news to all the world and use words if you have to, This has actually served to advance the gospel, When bad news is actually good news on October 28, 2013 by Bryan Thayer. We recently took a relaxed, 3 day agenda-free back roads trip to view the autumn leaves of northern Iowa, southern Minnesota bluff country, and SW Wisconsin. Our goal was to celebrate life together, redeeming the time we have by making life memories, and enjoying God’s creation. There is something both exhilarating and calming about being surrounded by the beauty of nature. Not just the beauty of the changing leaves, but of the immense creativity and variety of things God has created for his and our pleasure. The trees and flowers, the wildlife, the warmth of holding hands as we hiked, the sound and feel of the gentle forest breeze, Marcia’s loving patience with me as I slowly made my way along the challenging paths… All these speak to a gracious and generous creator who loves us so much to bestow such gifts upon us. Even a walk through a completely spent prairie restoration area, now basically a field of ‘weeds,’ spoke a certain peace to our souls. On our forest hikes, our eyes were constantly on the watch for the wildlife but also focused on the trail to keep from stumbling over exposed roots and rocks. It served as a reminder to maintain vigilance and awareness of God’s abiding presence all throughout the day’s journey. Our constant awareness of his presence in our lives provides us with his protection with each step we take. Where do you find real restoration? How does God’s creation speak to your soul? And how does he speak to you as you step through the paths of a common day? May he use those steps to remind you of his abiding presence and how much he cares for you. And may you, in his presence, find great satisfaction! This entry was posted in Faith, Living With Purpose and Passion, Memories, Relationships and tagged 1 Chronicles 16:11, 10;17 chromosomal translocation, Back roads trip, Give careful thought to your steps, God's creation speaks of his presence, Hixton State forest, Nature makes known God's divine qualities, Peace for your soul, Pikes Peak State Park, Proverbs 4:26, Romans 1:20, Seek God's presence continually on October 27, 2013 by . Medical Update: What would you do without an experienced guide? This morning as I was unable to sleep, I found myself thinking back on the white water rafting trip our family took in Colorado years ago. As first time rafters, we were both excited and apprehensive about the moment by moment thrills of the experience. Our experienced guide, having been down this river many times, had both the mindset of being calm – because he knew what was around the bend – and also vigilant, because he knew the potential dangers that could arise at any moment. That’s how it is with me and my medical team. Being my first (and hopefully only) time down this river, I tend to see things through the experience of my current symptoms. My experienced and caring medical team is concerned with saving my life. The team agrees that my recovery is well ahead of the curve (thank you God and prayer partners! ); but they have their eyes somberly set on what’s around the bend, especially in the next 6-18 months. This is the time it will take for my body to fully rebuild the immune system and regain strength and deal with oncoming threats. An interesting component of the treatment plan is that while the goal is to grow the immune system, the approach is actually to suppress it in the beginning so my donor cells don’t attack my body. This is called Graft Versus Host Disease (GVHD) and was what led to my Failure To Thrive diagnosis the three summer months when I couldn’t eat or get much beyond bed or recliner. So I take daily medications to prevent my immune system from functioning even as optimally as it could with currently limited resources. The team monitors the degree of ‘fighting’ that goes on in my body, trying to maintain a balance. Some fighting is good; too much is dangerous. Gradually, they will reduce the suppressing medications to let my body take on more of the fight on its own. I am also working to get off the steroids that have helped me overcome the Failure to Thrive condition but have also wreaked havoc with other mental and physical functioning. Nearly seven months post stem cell transplant, I still make trips every two weeks to the U of I Hospitals for blood tests, lung treatments and follow-up consultation. What’s around the bend? Continual protection against infections and increasing endurance and strength, and hopefully regain mental capacity; and trusting our loving God to guide us through the waters as we also journey into our new mission field. It is an amazing journey! I pray yours will be less dramatic but no less exciting and rewarding. This entry was posted in Leukemia/Cancer, Memories and tagged Failure to thrive, Graft versus host, GVHD, immune suppression, Immune system, Leukemia/Cancer, trusting an experienced guide on October 26, 2013 by . The commonality of great books and inspiring quotes is that they speak to us in ways that both our mind and our heart recognize as having lasting and essential value. They cut through the distractions and frivolity of life and lead us into the presence of eternal truths. Like the life saving beacon of a lighthouse, they guide us through rough waters to the safe harbor God intends for us. They remind us our purpose is not to drift aimlessly through life, but to be guided by a secure and firm hope of living well and finding satisfaction in our journey’s end. Like the CS Lewis quote above, they keep us focused on living life honorably and without need for regret, because we have known great joys together. In this quote, the word ‘together’ refers to the Christ-character of Aslan. In our life, it is the joy of sharing in the joy of Christ himself; the same Christ who freely offers to live in the hearts and lives of his followers. I hope you will take time today to celebrate the joys of living well, with God and with others, so that we may one day die well too and enter a new prosperous life that lasts forever. How else will your light shine in the world? This entry was posted in Faith, Living With Purpose and Passion, Relationships and tagged CS Lewis, filled with the joy of God's presence, Knowing great joys together, Narnia, Psalm 16:11, The joys of living and dying well, The Last Battle on October 25, 2013 by . Which set of three words would have more impact on your life? Could you fit all six words together? (Feel free to substitute any other trial of cause of suffering for ‘cancer’.) What happens if we refuse to reconcile the apparent paradoxes of life: good and evil, free will and the sovereignty of God, the presence of unwanted and painful circumstances with a great and loving God? Do we not miss out on life by only accepting that which easily pleases and satisfies us, that which we think we can handle on our own? Does avoiding the tensions and conflicts presented by real faith cause us to retreat to a ‘safe comfort zone?’ A place that seems safe but that in actuality leads us to a dangerously mediocre life? The truth is, we all face trials in life. No matter what you believe or how fervently you live out your beliefs, there doesn’t appear to be a “Get out of suffering” card that is universally available. However, God does provide a “get out of being controlled by our circumstances” card. It has the words, “Trust me,” inscribed on one side of it and “I will give you peace,” on the other. Trusting God in difficult situations creates a space between the painful circumstance and our response to it. In this space, we seek and find God just as he promised. (You will seek me and you will find me when you seek me with all your heart. Jeremiah 29:13) In this space we find refuge from the control our circumstances might otherwise have on us, dragging us down in self-pity, away from the joy God would have us experience. It is the space where we remember who we are in God’s sight and who he is. In this space we find his light shining into the depths of our sorrow, our pain, and our disappointment. If we choose instead to trust ourselves to solve our own problems, we find it impossible to find this peaceful space. We strive and we pursue, but our efforts do not bring us peace. They do not make us victorious. When three words, God loves me, become a reality to your everyday living, this space of peace, not your circumstances, determines your life. In this space you find freedom you’ll find nowhere else. Without the space, peace is ‘nowhere.’ With the space, peace is ‘now here.’ Ah the difference trusting God makes, by creating space for his peace in our lives! Enjoy seeking God and responding to his amazing three words. Enter into his presence throughout the day and enjoy the space his peace creates. This entry was posted in Faith, Living With Purpose and Passion, Memories, Relationships and tagged addressing life's paradoxes, Dangerously mediocre, faith, finding peace, No get out of suffering card, The space between pain and our response to pain, Three words that change your life, Trust God on October 24, 2013 by . “What if our lives could be expressed as the result a mathematical equation such as Pi? Consider if every moment of our existence were represented by a Pi like digit. If our individual existences could be expressed as a mathematical equation, would it be considered rational or irrational? As a rational number, there will be a final digit. The long series of digits will come to a calculated end; one last digit and then no more. There are many people who believe their life is rational. It has a beginning and it has an ending. They believe that their experience on this world is all that there is. However… what if there is an infinite existence beyond our experience of beginnings and endings? By faith, I believe what the scriptures tell us. The digits of our lives will continue without end, just like Pi. All of mankind was created as unique irrational numbers. Just because our bodies may die does not mean that our unique calculation does not continue to generate another digit. Man was created for eternity with a brief period spent on earth with purpose in every digit. Every digit of Christ’s life had purpose. (Each) of the digits of Christ’s life would reveal the names of all He touched, all He showed love, all He condemned, the date of the cross, His resurrection and His ascension. There was purpose and intention in every digit of Christ’s life. If God created the equation of Christ’s life on earth with precise meaning and intent in every digit, then why would we think that our lives are random and purposeless? We were created to be uniquely irrational. We were created with purpose; a string of digits full of meaning and intention. We are the product of the great Mathematician. He created the uniquely irrational equation that describes you and me. He prescribed in us every digit, in the precise order that He intended. We were created for the infinite. I often forget that reality. I often don’t live for the infinite. This entry was posted in A Life of Adventure, Faith, Living With Purpose and Passion and tagged Irrational faith, JD Blom, Live for the infinite, Live with intentional purpose, living irrational lives, Pi on October 23, 2013 by . My first thought in reading this quote is just the opposite; how much we need each other. I found this to be so true in the first nine months of leukemia treatment. Suddenly pulled from my normal routine of vibrant interactions with dozens of people daily, I found months of relative solitude to be a rather ‘painful’ experience. In fact, Lewis does address this earlier in his message. “We are forbidden to neglect the assembling of ourselves together. We are members of one another.” The Christian experience, without the building of true community is an oxymoron. We are meant for one another. But what is it about our soul that leaves it starved also for solitude and meditation? We live in a world that makes constant demands for our attention. A steady flow of never-ending electronic beeps calls us to tasks, appointments, and endless access to news, social information, and status updates. Imagine going for days without any food or water. Soon you will discover the depleting effects from lack of nourishment: weakness, lack of productivity, confusion, irritability. The more you work, without replenishing your resources, the less you will accomplish. The less you accomplish, the more you will be tempted to work harder and longer. But it will not satisfy. The vicious downward spiral always works against us. The truth is we need both the solitude of meditation and the true friendship and community with others. We cheat ourselves when we neglect one or the other. I hope you will intentionally pursue both of these today. It is the path of experiencing God’s best for you. This entry was posted in Faith, Leukemia/Cancer, Living With Purpose and Passion, Relationships and tagged be still, Building community, CS Lewis, faith, Joshua 1:8-9, Martin Luther, meditation, on eagles wings, Psalm 19:14, Psalm 23, Psalm 46:10, Psalm 91, restoration, Solitude, The Weight of Glory, three hours in prayer on October 22, 2013 by .